Fall is my favorite season (I think I may have said that a time or two)! The flavors of the season are part of the reason...pumpkin, apples, fall spices, caramel, they all translate to comfort and home to me. What better way to celebrate this time of year with caramel apples. 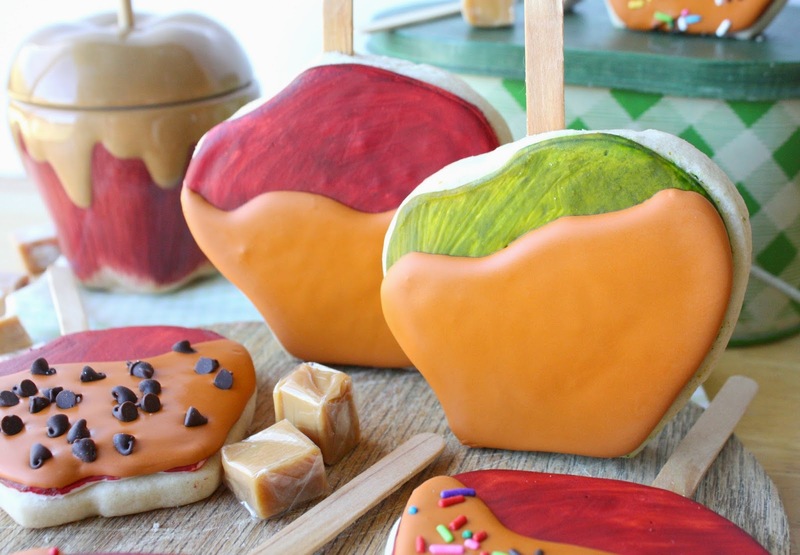 Well, not real caramel apples, but cookies that look the part. I had so much fun with these cookies, that I may just make some more, but this time I think I'll use actual caramel to coat the cookies. These cookies have been iced with white royal icing and then painted with gel paste food coloring. I then added the partial layer of caramel colored royal icing. It was the perfect backdrop for these cookies. 1. Roll dough out about 3/8-inch and cut out cookies with the apple cookie cutter (Mine had a stem and leaf which I cut off before baking) and place on the baking sheet. 2. Use a small, sharp knife and place a slit in the top of the apple and carefully insert a popsicle stick. For the free standing, upright apples, I placed one cut out apple on the baking sheet and then gently pressed a stick on top of it (about a third of the way down), and then I placed another cut out apple on top of it and pressed them together, gently. I also trimmed them straight across the bottom, to assist in them staying upright. 3. Bake cookies as directed. 5. With the white, untinted royal icing, outline and fill each apple. 6. Allow cookies to dry overnight. 8. Allow the paint to dry completely. 9. Tint the white royal icing to make it caramel colored: 4 parts orange, 1 part electric green, 1 part chocolate brown. Thanks, Lilaloa! 10. Add the caramel colored royal icing with a #3 tip: outline a fill, free form. Allow icing to dry completely. I think real caramel would be awesome. If you end up using the caramel, I hope you post pictures! I need one now. They look lovely! You're too funny, Lisa; thanks! 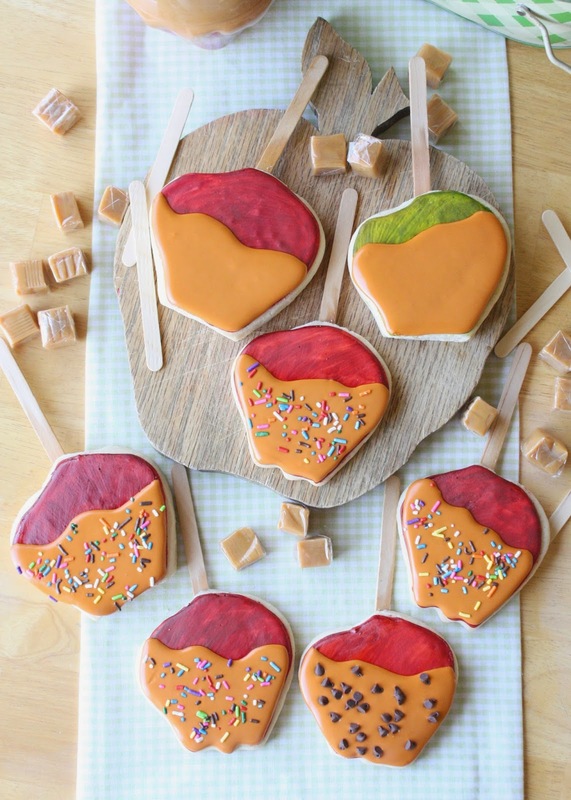 I love caramel apples and I'm pretty sure I love caramel apple cookies too. They are so cute! Hey, I didn't know you could bake wooden popsicle sticks! I was always afraid they would burn or something in the oven. The apples with the fun colored jimmie sprinkles are my favorites. :) Love 'em, Sue! Oops, I didn't even think about it, haha! Thanks for your comment, Melissa! 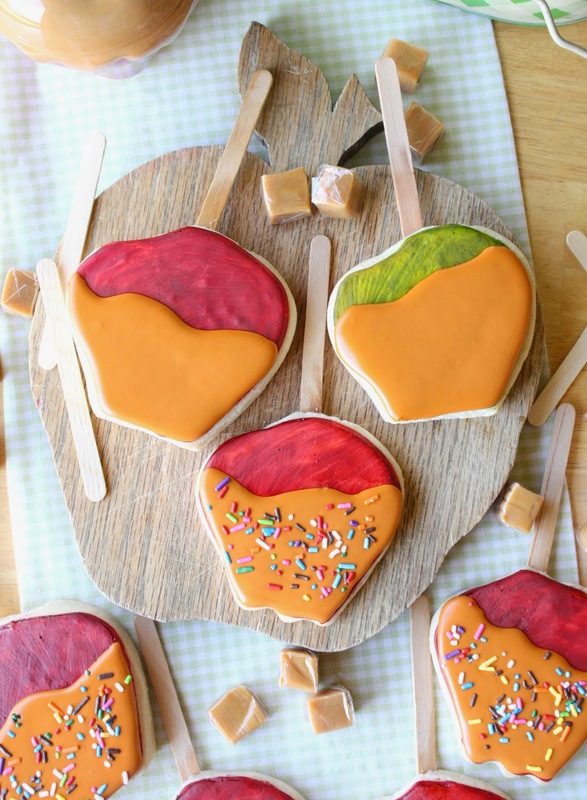 These apple cookies look gorgeous! Beautiful and delicious!